This behavior chart is intended to be a positive tool to help your child visualize the progress of their day or goal. This should be a motivational tool to help your child eliminate negative behavior, as well as reinforcing positive behavior. This is a very simplistic color chart where you move a marker from level to level. You can use a clothespin to mark the level, use stickers, or write a smiley/frowney face with dry erase marker. I have seen other color charts around, but did not like how often these charts were very negative. And they were backwards, purple is the best and should be on top. This should not be used for public shaming, you should never point out to a sibling, parent, or classmate that your child is doing badly that day, no matter how bad they were. If necessary, only use the chart when older kids are at school and Dad is at work, and clear the chart later in the day. If your child lands in the red you should explain to them what they did to warrant it, move the marker, and then suggest something they can do to move the marker up. For my children we have a list of suggestions, like do an extra chore, make silly faces until somebody giggles, do something nice, run around the house once, help a sibling, or play blocks with mom (this mom likes playing with blocks). If you do a behavior chart you have to be vigilant and change it for both good and bad behavior. Small children especially benefit from immediate feedback. You might want to just do this on the weekend or a day when you know you will be home and you can be consistent and pay attention to what your child is doing. This way you can explain what they did and why it was good or bad. This will facilitate a dialogue between you and your child which will help them understand what the desired behavior is. We establish what rewards are and what will need to be accomplished to achieve that reward before something like this is implemented, so the child has the tools they need to succeed. You can write directly with dry erase on the laminated chart what constitutes each level of behavior, for example being asked to put away their coat puts their glimmer dimmer, dropping the coat on the floor on purpose makes them mind the moat. If you are clear about what is expected and what will be achieved your child will have a goal to attain. This is another way to reward positive behavior. Some examples of rewards are hot cocoa, stickers, fruit snacks/goldfish/fun treats, a toy from the dollar store, watching a video, choosing the game for family time, two minute dance party, choosing from three choices for Saturday dinner, taking a trip to the park, going to the store with mom, baking muffins, or whatever else will motivate your child and is appropriate for the amount of effort involved. 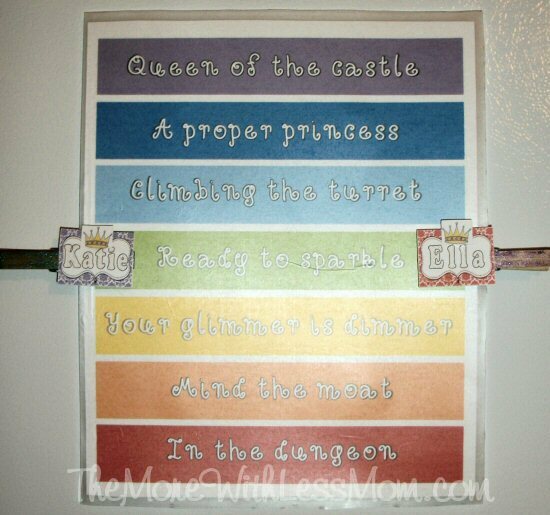 If your child is spending all day every day in the dungeon then you as a parent need to change something. Either you are not seeing the positives, or you need to change something in your child’s day to help them behave better. Make sure you are not setting your child up for failure, and establish reasonable rules and attainable goals. I laminated mine so it was a little more stiff (I just folded over clear contac paper, you can see the crease in the middle where this tried to not work). I used adhesive magnet buttons on the back so there was a space between the fridge and the paper that the clips could fit in. To make my clips I made little name tags for each child. I painted clothes pins with sparkly nail polish and attached the name tags, reversing one so I had one on each side. I used clip art I found online for the crowns and frames on the name tags. What tools do you use to manage your child’s day? These are fun! We have chore charts and catch you being good jars, but I need something for behavior. I was going to get links, but I like this better. Thanks for sharing! I like the good jars, too.